Ida Ehra leading actress and Grand Dame of the German stage. Born the daughter of a cantor in Vienna and a student of the the Academy for Music and Theater in Vienna, she moved to Berlin in 1933. In 1933 she was barred from the stage by order of the Nazi party and worked instead as the assistant to her husband Dr. Bernhard Heyde (1899-1977), a prominent gynaecologist. They and their daughter planned to leave the country after Kristallnacht, but the outbreak of the war made this impossible. She was arrested by the Gestapo in 1943 and taken to Fühlsbüttel concentration camp, a first step on the road to Buchenwald. She avoided this fate only because her (non-Jewish) husband was able to arrange her release by writing a personal appeal to an old school mate, Heinrich Himmler. Misogyny is a bane of any age and certainly the Greeks were as prone to it as any culture, but as in all things, men seem willing to make exceptions when the woman in question is notably accomplished, no longer a threat to the living, and somehow a credit to their own homeland. Thus, the historian Herodotus of Halicarnassus is happy to give us the story of Artemisia, queen of Halicarnassus, despite her being a) a woman and b), a military commander of the hated Persians. Son of a highly successful financier and tax farmer, Grimod de la Reyniere was born in 1758 with a pair of deformed hands, apparently shameful enough to keep him indoors and out of public sight throughout his childhood. Swiss craftsmen fitted him with prosthetic hands, with which he learned to use a knife and fork and, more importantly, a pen. He trained as a lawyer, wrote the odd play and criticism (pen name: Le Censeur Dramatique) and socialized with philosophes and other intellectuals. Youthful excess – the pregnant girlfriend, not to mention that time he got caught by an unsuspecting father for throwing a party in which a pig presided at table– saw him get banished from his family’s Paris mansion to a distant abbey. An Ohio boy who first apprenticed as a carpenter, Thompson worked as a grocer, then designed a machine to create stockings and founded the Eagle Knitting Company at Elkhart, Indiana. Hard work impaired his health, a prescribed trip out west was supposed to improve it. En route, he saw the Mauch Chunk Switchback Gravity Railroad, a coal carrying freight train which, in the slow season, took on thrill seeking passengers for a quick rush down the side of the mountain. Gravity trains for pleasure, so-called Russian Mountains, had been build in Russia and France as far back as 1790, but Thompson took the concept to the big time. 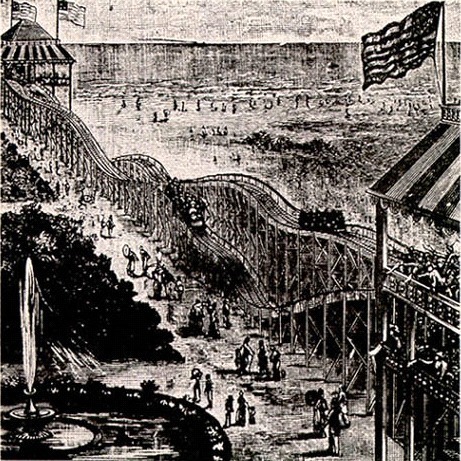 In 1884, after three years of tinkering, he opened the Gravity Pleasure Switchback Railway at Coney Island. For five cents you could climb a tower, get on the train, and thrill to the six miles an hour rush to the second tower. Success was immediate, and the L.A. Thompson Scenic Railway Company (and the inevitable copycats) was soon making others in America and Europe. Oval tracks, painted scenery, tunnels, all sorts of improvements and patents followed. The craze made him a millionaire, proving yet again that, pace Scott Fitzgerald, there are plenty of second acts in America. Americans, if they know of Marie at all, will half-remember Dorothy Parker’s typically snarky quatrain above. She deserves a lot better, and so, a short primer. Marie was born in Kent in 1875, granddaughter of Queen Victoria on her father’s side and Tsar Alexander II on her mother’s. In 1893 she married Ferdinand, heir to the Romanian throne. Before the second war, my father, then age twenty, was third mate on an American ship that sailed to the Black Sea and back. Among the souvenirs of that time were some Bulgarian coins dated 1930 on the obverse of which is a man on plow horse for which he is clearly over-sized, apparently skewering some kind of half-sized lion while a dog carries up the rear. It says simply, Krum, 814. Clearly some kind of serious hero to get on both the five and the ten leva coin, and as he is obviously a household name in Bulgaria, it’s a little shameful that as an American I’d not heard of him before. And what of 814?